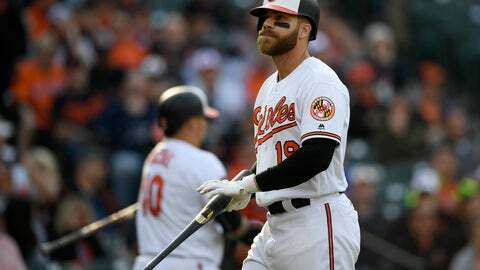 BALTIMORE (AP) — The new regime of the Baltimore Orioles inherited a costly problem in slumping slugger Chris Davis, who’s working with a $161 million contract yet can’t buy a hit. After batting .168 last year — the lowest average by a qualifier in major league history — Davis opened this season going 0 for 17 with 11 strikeouts. Combined with an 0-for-21 finish in 2018, he’s looking for his first hit since Sept. 14. Orioles fans have run out of patience waiting for Davis to get into a groove. Many in the sellout crowd at Thursday’s home opener booed him during each at-bat, then cheered when he was lifted for a pinch-hitter in the eighth inning. Although the 33-year-old Davis doesn’t really fit in with the youth movement being overseen by first-year general manager Mike Elias and rookie manager Brandon Hyde, the Orioles can’t afford to cut him loose. Not yet, anyway. Davis wasn’t in the starting lineup Saturday night against Yankees southpaw J.A. Happ, for good reason. Davis, a left-handed batter, is 4 for 27 lifetime against Happ with 12 strikeouts. “Obviously, it’s been a tough stretch for him. But I look at it as, he’s a dangerous hitter and we’ve still got to make pitches against him,” the manager said. “To feel that in front of your home fans, I mean, I can’t even imagine. I do feel for him,” starting pitcher Alex Cobb said. Last June, then-manager Buck Showalter put Davis on a mandated hiatus to work on his hitting. It didn’t work.